When I was in India, my neighbour aunt always calls me if she makes channa masala in her house. She is an extraordinary cook and channa masala is one of her speciality. Even restaurant's channa masala can't compete with the taste and look of her recipe. I am very happy to share her recipe with you all. Soak the channa for 4-5hrs and then pressure cook it with a pinch of salt for 3 hisses. Make sure you add required amount of salt (required for channa alone) while pressure cooking, otherwise you have to say bye bye to your dish. In a pan, add oil ,cumin seeds and whole garam masala and wait till you get the aroma of the masalas. Add the finely chopped onions and fry them till they are brown. Add ginger garlic paste and saute. Now add green chilles, and tomatoes and saute them for few minutes. Add turmeric and chilli powder and mix them well. When the tomatoes are well cooked , add channa masala powder and add the water that we drained from the channa while pressure cooking. Add salt. Let it come to a boil. Now add the channa and mix well. Cook for 5 - 10mts in Sim flame. Garnish it with finely chopped cilantro and finaly add some lime juice and serve hot with Batura, Parathas, roti, puri or you can have this as a chat. 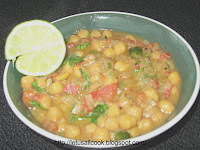 2.You can also mash few channa and add it to your gravy for better mixing. Chickpeas are a helpful source of zinc, protein. They are also very high in dietery fiber and which results in a healthy source of carbohydrate for persons with insulin sensitivity or diabetic. One hundred grams of mature boiled chickpeas contains 7.6g of dietry fiber and thats what we are talking about. This goes to my Eat healthy- Fiber rich event. This is nice blog to visit,you have done a good job and your representation very effective.Ever body likes indian food troug out the world.